Just as peacefully and quiet as he lived, Ralph Fred Thisted, 91, of the Ninemile Valley, Montana, passed away Tuesday, May 9, 2017, of natural causes, at home, with his wife and family members by his side. Ralph is the husband of longtime member Betty Gaither Thisted. Ralph was born Nov. 12, 1925, to Fred and Claudia Thisted in a small cabin on Birch Creek, near Valier, located on the Blackfeet Reservation. The family ran several bands of sheep while living on Birch Creek, enjoying life there until it was time for Ralph to enter first grade. The severe winter weather did not allow him to ride his horse the 4 miles to the one room schoolhouse, so the family moved to Raynsford, a small community near Great Falls, a whistle stop on the railroad, where the family raised a few cattle, did some farming, and were able to board their children with a family to attend school in Great Falls. Drought conditions prevailed in the Raynsford area the next few years, which prompted the Thisteds to begin their search for another place to farm and ranch — a place where there was abundant water. Ralph remembers the comments his mother made in 1937 after visiting the for sale ranch in the Ninemile, "we have found just the place, there is plenty of running water in the house and indoors plumbing." And so the ranch was purchased and to the Ninemile the family moved in 1938. Ralph attended school in Alberton and following graduation in 1944 he was drafted into the United States Army serving in the Pacific Theater as part of the occupational forces stationed in Kyoto, Japan. In November 1946 he received an Honorable Discharge from the Army. Following the war, Ralph decided he wanted to learn to fly, so off to Missoula he went to take flying lessons at Johnson Bell Field, sometime landing and taking off from the ranch at Ninemile. To get to and from for his flying lessons he knew the most economical and fun way to travel was by motorcycle, so he found the right vehicle, a 1946 Harley Davidson. Before partnering with his brother and parents to run the ranch, he spent two years at MSU studying the basics of agriculture to better understand the cattle and farming business. This was a successful way of life for the family working hard to enjoy all aspects of what that life took on, i.e. a wonderful family life in a pristine environment, opportunities to improve the land by removing all tree stumps left from earlier logging operations in order to level and provide appropriate ground for agricultural purposes, and logging only when needed. He was active in controlling invasive species by pulling them and/or using herbicides to protect the hay fields and forestlands, careful not to overgraze the land and only selectively log. The land was not exploited or destroyed for economic health. No mining operations were allowed on the ranch property while care was taken to protect stream banks while ranching. One of the more significant events for Ralph was the appearance of a pair of wolves in the late 80s on the Thisted Ranch. Unknowingly to the wolves, it was a fortuitous encounter that likely shaped the outcome of the reintroduction of the wolves to Montana. Ralph, along with wildlife biologist Mike Jimenez at the University of Montana, helped keep the wolf pups alive after both parents had been killed, one shot and the other hit by a car. They would find road kill to feed the pups being careful not to interfere with their natural instincts all the while monitoring their progress with a telescope from the living room window and videoing them from an old hay shed on the ranch. Rick Bass in his book, "The Nine Mile Wolves", writes "Ralph and Bruce are the damnest ranchers I've ever met. They've got the attitude towards nature that you usually only see in the movies, or in a few extremely old Zen priests, an acceptance of boundaries, and of the knowledge that not all nature can be controlled. Maybe the wolves sought them out." Ralph and Bruce sold the ranch in 1992 to Rosalie Anderson McDowell and family. After retirement, Ralph and Bruce were invited to join Rose's family as they enjoyed the locations of her different movie sets such as London, Chicago and Vera Cruz. Ralph took her up on it, all the while enjoying being with the family and experiencing new worlds. What a wonderful change of pace that was for Ralph and such an enjoyable one! Moving on to new worlds in 1997, Ralph proposed exploring more new worlds - like marriage to his neighbor — biking and skiing friend, Betty Goaux, nearing her retirement from teaching at Frenchtown High School, and going around the world. That was just the ticket, new worlds they began to see. 1997 — Our honeymoon trip — an Epic Rail Journey Across the World of Ghengis Khan with stops in Kyoto to revisit Ralph's army stay in 1945-1946 and a visit with son, Carl and family at the Marine Base at Naha, Okinawa. 1998 — The Ancient Silk Road through China and Central Asia by private rail. 1999 — Trip to the Three Pillars of Civilization — Greece, Israel and Egypt. 2000 India — A boat trip around the country with stops along the way beginning with Sri Lanka. 2001 — Nova Scotia, a scenic bicycling trip around the country. What wonderful experiences we had! What delightful guests, friends and family we enjoyed! The following years were spent in enjoying our Burnt Fork cabin — hiking, biking and skiing there. We had begun the restoration in 1998 and were fortunate that it was saved from the 2000 fire burning through the area. Lots of time and effort had been put into it's preservation, hoping someday to get it named as an historic homestead building. In 2013 that happened! Through the efforts of Janene Caywood of CRCS it was named as a historic building by the state and National Historical Society. How pleased we were — another opportunity to share with the community's history. Ralph was the perfect example of neighborliness, citizenship and land stewardship — all related to natural resources. These were qualities his father and mother modeled throughout their lives on the ranch. 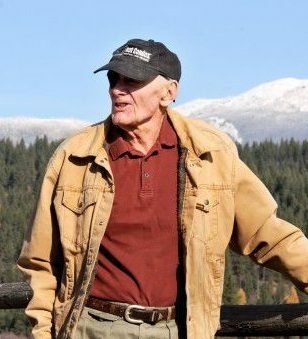 He worked tirelessly to sustain and improve the pristine appearance and health of the Ninemile Valley, putting conservation easements on the Burnt Fork and Josephine Creek properties. Several examples of Ralph's service to the community include serving on the Missoula Electric Cooperative Board, the Missoula County Weed Control Board, helping to create and work on the Ninemile Weed District and serving on the Frenchtown Rural Fire Board. He continued to care for and support the Ninemile Community Center as a lifetime past president member of it's board. Those early efforts put forth by Ralph at the community center along side his family and community members, paved the way for it's continued use and benefits to the community today. He partnered with others in the community to found the Frenchtown Preservation Council, an organization to thwart the efforts of the Yellowstone Pipeline from cutting through the valley to deliver their liquid fuel products. Those years of sustained efforts on the part of the community to protect the environment from potential oil spills and destruction of wildlife habitats speaks volumes about what measures people will undertake to protect the greater good. As recognition for Ralph's lifelong commitment to the community he has received a number of awards recognizing his commitment to the Ninemile wolves, wildlife and land stewardship. Several awards include: the Don Aldrich Award in 2002, Missoula County Rural Initiatives Land Stewardship Award in 2011. Our family wishes to express sincere gratitude and appreciation to the doctors, nurses and staff at CPG North and the Oncology Clinic at Community Medical Center for their attention and care to Ralph over the last few years. Also to Hospice of Missoula and their staff, we send our thanks and appreciation for their attention and care given to Ralph his last few weeks. Ralph is survived by his wife Betty and children (and spouses) Elizabeth Levitzky (Michael), Renee Gouaux (David Smith), Eric Gouaux (Isabel Baconguis), Carl Gouaux (Cherie) and grandchildren Edward and Sarah Levitzky, Gaither, Ada, Stirling Smith, Alec and Rebecca Gouaux, Gabriel, Stella and Thalia Gouaux and his sister, Ruth Chandler and family of Missoula. Ralph was preceded in death by his father and mother, Fred and Claudia Thisted, and his brothers Bruce Thisted and Lloyd Allen. Should you want to remember Ralph with a memorial, the family suggests a donation to the University of Montana Wildlife Department Scholarship Fund at the University of Montana Foundation, 950 Arthur Ave. Missoula, MT 59812 or to the Ninemile Community Center, P.O. Box 1061, Frenchtown, MT 59834, or to a cause of your choice. Cremation has taken place and a celebration of Ralph's life will be celebrated this fall on his birthday, November 12, at the Ninemile Community Center.